Can you make your skin not just appear younger, but grow younger too? Home / CELL Infuse Products / Can you make your skin GROW younger? Can you make your skin not just Appear younger. But GROW younger too?? Many times I have shared the wonderful benefits of Hyaluronic Acid. It is in so many skin care products today, due to the great benefits it gives. Hyaluronic acid is wonderful for aging skin. As we have heard many times a babies skin has high levels of Hyaluronic Acid but as we age we lose it. Hyaluronic Acid is the greatest discovery in anti-aging skin care. many know it is one of the best ingredients for penetrating skin, hydrating it and assisting it to look younger, and studies prove it. But as I research i learn it turns out hyaluronic acid has a more important use. This is even more exciting!! It can be what’s included with the Hyaluronic Acid which can make skin not just Appear younger, but GROW younger too. Because hyaluronic acid is so easily absorbed, it can then deliver other healing and rejuvenation ingredients deep into your skin. Concentrated extracts assisting collagen, addressing inflammation, can assist in melting away common signs of aging wrinkles, fine lines blemishes and crow’s feet. This is one of the reason I put Uncaria tomentosa in the products or more commonly called Cat’s Claw. Studies prove Uncaria Tomentosa activates the enzyme telomerase. 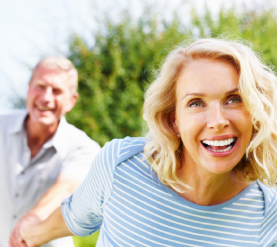 It can signal your telomeres to grow longer and produce younger cells. That is what we want !!! STEMULATE is your answer right here at CELL INFUSE Australia with all of the nutrients. Other CELL INFUSE products with hyaluronic acid are Advanced Moisture Repair and Anti Aging Spritz. 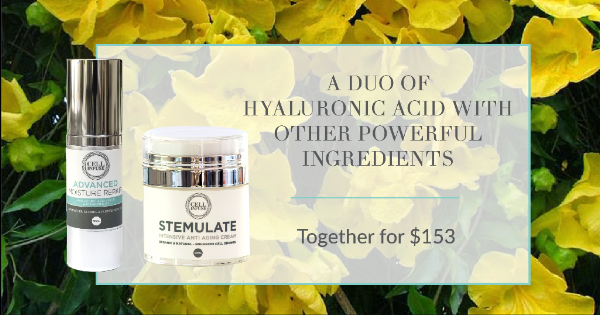 Special Offer: CELL INFUSE Advanced Moisture Repair Serum and STEMULATE together for $153. Normally $181. Click here to order now.